NEW YORK—In September, 22-year-old Rutgers student Darsh Patel was mauled to death by a black bear while hiking in the Apshawa Preserve in northwest New Jersey, marking the state’s first fatal encounter between bear and man in over 150 years. Black bears are mostly averse to confrontation with humans, and attacks are rare. Between 1900 and 2009, only 63 people were killed by non-captive black bears in North America, according to an analysis in the Journal of Wildlife Management. During the 19th century, deforestation and unregulated hunting had devastated black bear populations. This led in the mid-20th century to a federal restriction on selling bear meat. States also stepped up to regulate or stop the hunting of bears. With no natural predators or pressure from humans, black bears have made a precipitous comeback in the past few decades. Now the pendulum has swung too far in the other direction and bear intrusions into residential areas are increasingly common. There were several incidents of black bears wandering in residential neighborhoods in South Jersey this summer. And in October, a tape of a six-minute fight between two black bears on the front-porch steps of a suburban North Jersey home became viral online. 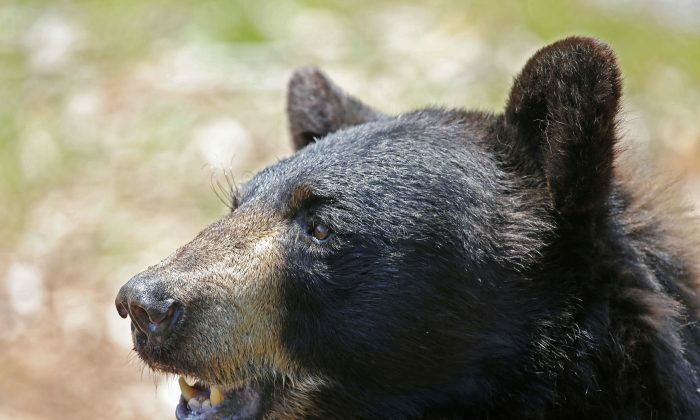 In 2009, New Jersey saw 257 cases of dangerous Category I bear incidents, which include attempts by a bear to enter a home, a car, or a tent, and attacks on dogs and livestock. That year also had over 500 reported cases of bears rummaging through trash and 145 traffic collisions. The black bear population in New Jersey was an estimated 300 in the early 1980s, but ballooned to over 3,000 by 2010. 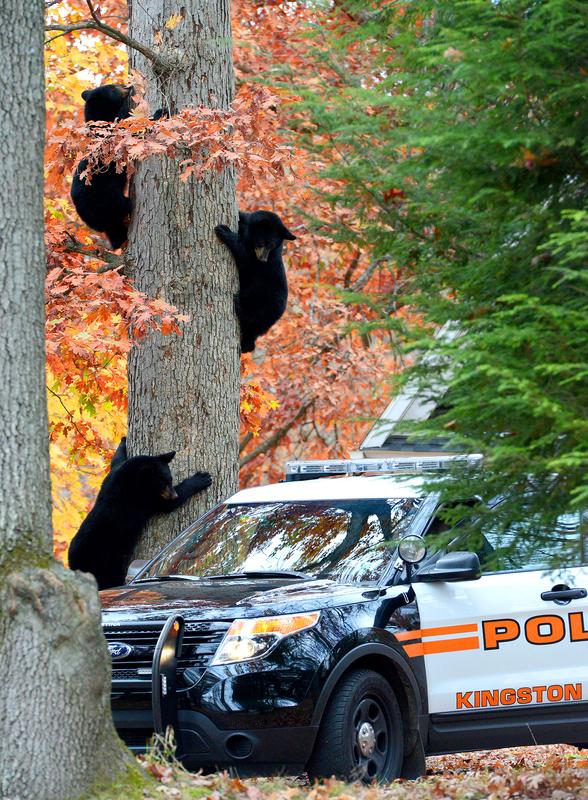 At that point, the density of black bears in northwest New Jersey was the highest of any state, said Larry Ragonese of the state’s Department of Wildlife Protection. In response to a growing number of hostile encounters between humans and bears, the state created a five-year bear management plan in 2010, allowing for a six-day period of bear hunting per year to keep the population at a sustainable size. The hunt is scheduled December 8-13, around the time when bears transition into hibernation, to minimize the hunting of pregnant mothers. In the first year 592 bears were killed, but the overall population grew because more cubs were born over the winter, although it has now fallen to around 2,400 from its 3,300 peak. “If you have a high density, you have more movement,” said Randy Cross, a biologist with Maine’s Department of Wildlife. Cross says that once the bear density is high enough, there will be pressure for bears to leave the forests to look for food elsewhere. Managing the bear population through hunting hasn’t been universally applauded. 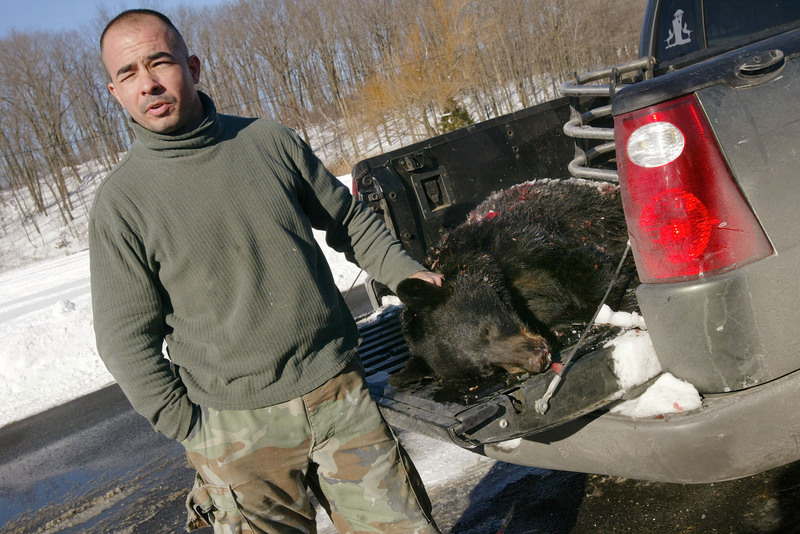 New Jersey first reintroduced bear hunting in the winter of 2003, and then again 2005, but then-governor Jon Corzone put an end to hunting after pressure from animal rights’ activists who argued that non-violent measures were enough to prevent human-bear conflict. Some experts advise residents who live within proximity to black bears are to refrain from using bird-feeders and planting fruit trees, and to put their trash out in the morning when trash is taken rather than the night before. Activists say that taking these precautions and adopting bear-resistant trash cans can effectively defuse the threat of wandering bears. However, others argue that hunting is necessary because in addition to cutting down on the population, it also modifies behavior by instilling a fear of humans among black bears. Mauro endorses that continuous hunting every year both keeps the population stable and habituates the bears to stay away from humans, and that hunting is ideal to “flatten the swings” in bear populations. Despite decades of moratoriums on bear-hunting, when it was permitted again in New Jersey in 2010, there was no shortage of hunters applying for the 3,300 bear-hunting licenses, which were all quickly snapped up, but the numbers have fallen since the program began. On the first year of the hunt, there were nearly 8,000 applicants, but in 2013 it had dropped to under 7,000. The Wildlife Department attributes this to bear hunting losing its novelty after people get their chance at it, as well as the harsh December weather. “In the last two years we’ve had bad weather, and the big hunt is the first and last day of the hunt … Last year we had really miserable weather on the first and last day, it was heavy rain and it was miserable,” said Ragonese. This December will mark the end of New Jersey’s five-year bear control plan, and the Wildlife Department is in the midst of preparing for the last hunt. It is also gathering data to assess what a continuation of the program should look like. The initiative has already seen a marked success in curbing high-risk Category I bear incidents, which fell from 200 in 2011 to 129 in 2013, although this year has seen a slight uptick at 169 incidents. New York has had a much more stable bear population, with an uninterrupted annual harvest of black bears in the hundreds going back to the 1950s. Most of the hunting activity is concentrated in the northern, Adirondack region, but it has expanded to the south in recent years as the bear population crept back up. “Since the mid-90s we’ve seen substantial growth in the bear range in New York in the southern half of the state, as bears have moved towards the Mohawk valley out of the Catskills areas,” said Jeremy Hurst, a bear biologist with New York’s Department of Environmental Conservation. “It was intentional, we were coming out of a conservative management. In the 2000s, we transitioned to more of a management standpoint where we would increase harvest opportunities,” said Hurst. Hurst says that a problem with the expansion of bears in the southern part of the state is that many people there have little experience with bears and don’t take the necessary precautions such as being careful with their trash. The state has a robust education program on living on bears. The Conservation Department created a DVD on the subject that’s available in every public library in the state, the website has an elementary class curriculum for bears, and staff also work extensively with residential community groups and police departments, but Hurst also stressed the importance of word-of-mouth education. CORRECTION: An earlier version of this article misstated the dates of the upcoming bear hunt in New Jersey. The correct dates are December 8-13. An earlier version also mischaracterized federal wildlife management in the mid-20th century. The correct federal regulations had to do with restrictions on the sale of bear meat. The states regulated hunting specifically. Epoch Times regrets the errors. In the US more than 50% of cats and dogs are obese or overweight, just 10% less than the human population. Will US Be Able to Follow Europe in Animal Testing Ban?